The most memorable part of my brief sojourn to Swedish Lapland last year — the trip that inspired me to go back for much longer this year — was my first venture out into the untamed wilderness in a sled being pulled by six huskies. I remember being bundled up in reindeer skins and canvas, listening intently as my guide, Juha, introduced me to a completely new world — a world where snow reigns for half the year and sunlight can last anywhere from zero to 24 hours. Definitely more than zero hours of sunlight here. It just shows that, no matter where you are or what you do, your idea of paradise is probably somewhere where you can relax, a place surrounded by nature where you can completely clear your mind. It helps if there’s a large body of water nearby too. I thought about this conversation as I walked the last few meters to my accommodation in Rovaniemi — one of many cabins in Ounasvaaran Lakituvat, perched on the side of the city’s ski hill. No, I wasn’t near a lake or fish of any kind, but it felt like I was in paradise. It didn’t feel like I was within 3km of a city of 60,000 people; instead, it was more like a little spot of wilderness where I could retreat from the world. By this point in my trip, I needed a bit of a retreat. Even on my trip of a lifetime, I couldn’t keep traveling forever. I wanted somewhere where I could stop and take a breath after two weeks of continuous travel that saw me have no more than two nights in one spot. Here, I would have three nights, which made all the difference. I could unpack my bags, wash my clothes, and not worry about having to throw it all back in my bag the next morning. My cozy living room at Ounasvaaran Lakituvat. My cabin — O28 — was entirely too large for just me, but I knew it would be from the outset. While I didn’t spend any time in the upstairs loft that had two single beds, I managed to use every other room in the chalet. I loved having access to a full kitchen, a lounge room, and my own personal sauna. 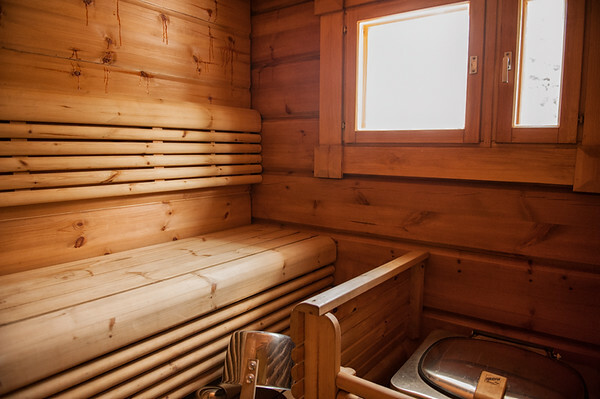 While it’s true that the sauna served as a drying room for my freshly-washed clothes one day, it was also a nice place to wind down after an incredible (but cold) night of aurora watching. Clearly, all real bathrooms should have a toilet, shower, washing machine, and a proper Finnish sauna. 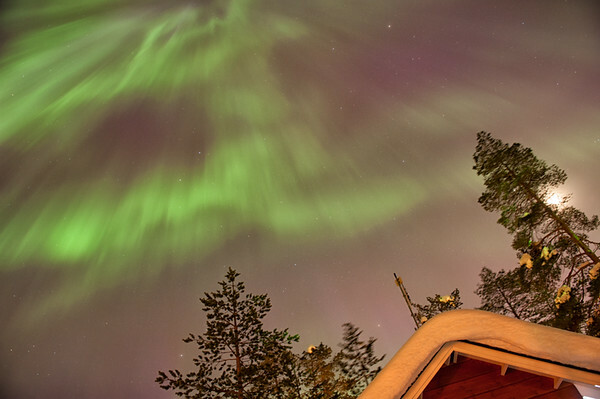 It was great to have my own log cabin to retire to in the evenings, but the highlights — the thing that made the cost and the expensive taxi rides into the centre of Rovaniemi worth it — were all outdoors. When I’d booked, I hadn’t realised just how close to the top of the Ounasvaara ski area I would be. A five minute walk gave me not only panoramic views of the ski fields (complete with a terrifyingly large ski jump), but also access to the top of the chair lift. The gorgeous fell landscape of Ounasvaara. How often is it (on a non-skiing holiday) that you can just walk out of your accommodation and within 15 minutes be strapped into the snowboard you’ve rented, ready to start a run? Looking down one of the runs at Ounasvaara. 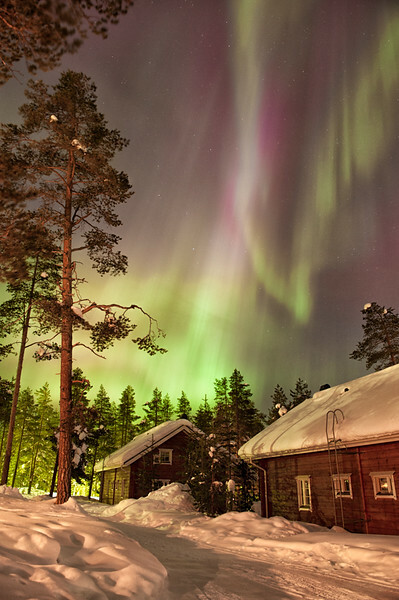 Even more importantly, how often is it that you can stay in a city and clearly see the northern lights? In Tromsø, I wouldn’t have been able to see the aurora with the city lights all around me. Here, the light pollution was about as low as you could get in a city, with only a few lights here and there to mark the path. One night, I decided to leave my chalet a little early in hope that I would see the northern lights on my way to the meetup point for my tour. Boy did I see the northern lights — the sky right above me seemed to be exploding with coronas, one of the most impressive types of auroral displays. The best way I can describe them is a black hole, northern lights-style: they seemed to be gobbling up all the pink and green in the sky, pulsating at a breakneck speed. It’s surprising that I made it to my tour at all. I could have stood five feet in front of my house and gawked at the aurora instead! One of the photos I managed to snap when I wasn’t too busy gawking. All in all, despite the fact that staying in a hostel in the city would have saved me a big chunk of change, I couldn’t have been happier with my decision to stay in the ‘wilderness’ of Ounasvaara. It fit in perfectly with what I wanted to do on my trip, and had I been in a larger group, it would have worked out much cheaper than many of the single-occupancy hotels in which I stayed in other cities. 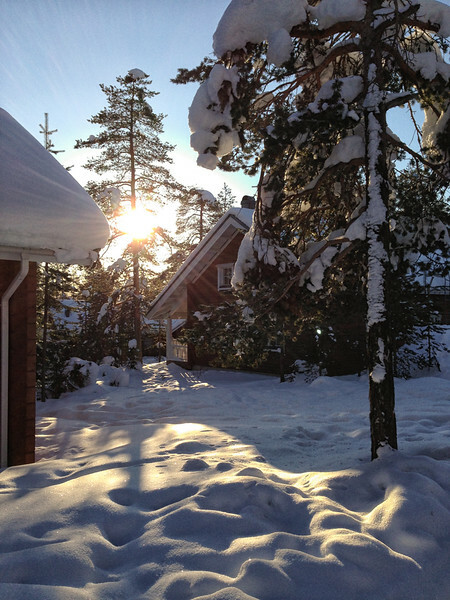 Winter or summer, I think this would be a great place to stay for a group or family that wants to see more of the fells of Lapland on a city break. An attempt to capture an auroral corona and not miss my bus. Didn’t have a lot of time for framing! When you travel, are you willing to pay extra for the location — or would you prefer to put that extra money into activities instead? My stay at Ounasvaaran Lakituvat was partially sponsored by Safartica, but all opinions stated here are my own. 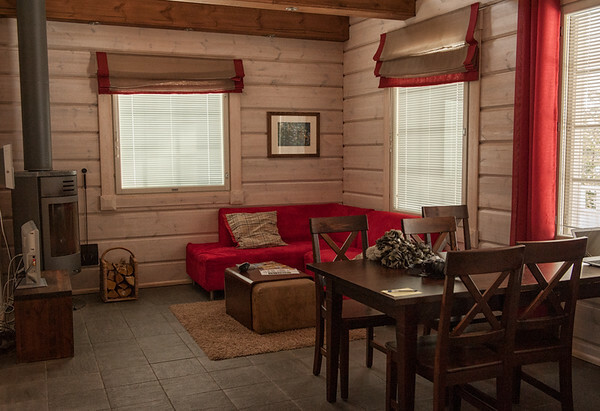 Stays at Lakituvat start at €310/night (winter) or €173/night (summer) a night for a cabin that sleeps up to 6 people. There is no reception area — keys are left in a box and the PIN is emailed to you beforehand. If you have any other questions or you’d like to book a tour, Safartica staff are available by phone at +358 500 968 558. Wired internet is provided in all chalets. They provide the ethernet cord, but if you’re like me and have a computer with no ethernet jack, make sure you bring an adapter. It’s hard to say whether having a rental car or taking taxis to the city would work out cheaper — it really depends on how often you’re going into the city. Each cab ride costs around €20 and you can book them by calling +358 600 300 30. Kristin, these photos are fabulous! I’ve enjoyed reading about your trip and seeing sights I hope to see in person one day. The chalet looks like a great place to rest and take everything in for a few days. The chalet definitely was the perfect place to get some rest. I’m glad I chose it instead of a hostel because it really helped to recharge my batteries for the next two weeks of the trip! Annie, it’s great to hear that you’re going to stay at Lakituvat as well. I hope you have a fantastic stay and that you’re able to see the northern lights as well. I’m glad my photos have helped you get even more excited about your trip! 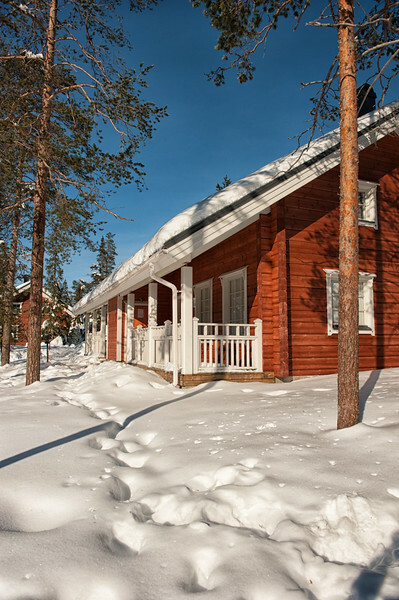 Hey I am from Singapore too and my family and 2 friends will be staying at this cosy cabin early Dec. We booked 4 safaris from Safartica and are all excited to visit Rovaniemi. Now thanks to your article we wish we had a time machine to fast forward to Dec. My wife and I actually visited Rovaniemi back in 1999 for our honeymoon but we stayed at the Scandic hotel which was in the city centre. Hi Stevie! 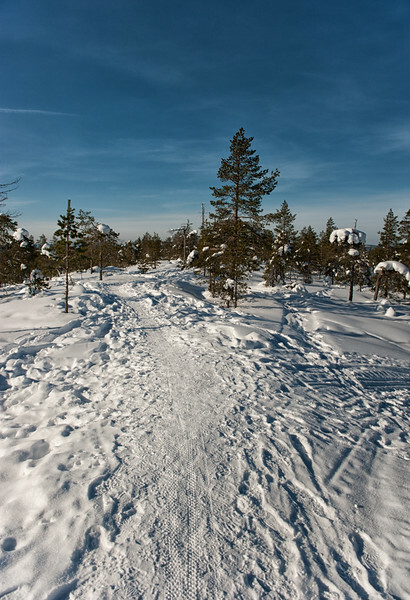 It’s great to hear that you’ll be staying in Rovaniemi soon. You’ll have such a fantastic time — I really enjoyed everything I did in Rovaniemi, including the Safartica evening reindeer ride. It’s wonderful to hear that my article helped to make you even more excited for your trip. I hope you have a fantastic time! By the way, what an awesome choice for a honeymoon spot. It’d be a very different honeymoon from the typical tropical one! I have been updating myself with Rovaniemi’s weather via their webcam and I just saw that they had heavy snow fall last night. Woohoo! Will certainly update you with pictures of our Winter escapade. BTW, Safartica has already started their snowmobile safaris. Woohoo!